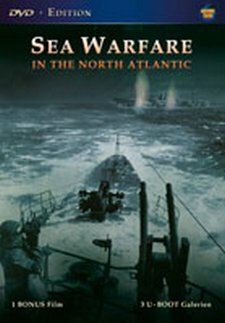 This DVD provides 58 minutes of rare and unseen footage shot by war cameramen and depicting the conditions during the North Atlantic battle between the German Navy and convoys maintaining supplies to Britain during WWII. DESCRIPTION: This DVD provides 58 minutes of rare and unseen footage shot by war cameramen and depicting the conditions during the North Atlantic battle between the German Navy and convoys maintaining supplies to Britain during WWII. As with most of the DVDs in this series, there are special features, in this case 3 bonus U-Boat picture galleries and a bonus film, all of good quality and great interest to history enthusiasts. The original German wartime footage includes original sound track. The English translation is somewhat stilted and presents the Nazi spin on events, but most will buy this DVD for the rare film and images. The battle in the North Atlantic went through several phases with the Germans enjoying advantage and success during the early phases until full air cover was achieved for Allied convoys and new convoy escorts became available in numbers, to the point where vessels could be dedicated to hunter killer groups operating independently of convoys to locate and destroy U-Boats. Often, the main enemy for both sides was the weather conditions. This was particularly true of the convoys to Russia, where PQ and QP convoys were under almost constant air and sea attack from German aircraft, surface ships and U-Boats. The DVD portrays these conditions graphically. For the Germans, the cost to U-Boat crews was extreme with few submarines surviving more than a few war cruises during the second half of the war. This footage is a must for naval enthusiasts.